this is not our hanukkiah; it's in storage this year, while we travel. back in the day, there were disagreements about which way to light Hanukkah candles. some said the number of candles should decrease each night, because that's more logical (as the amount of oil sustaining the light would have decreased each night, miracle or no). others argued that the number of candles should increase every night, to show how the light increased, metaphorically, each night, when there wasn't really enough oil to last all eight nights. so that we might end Hanukkah in a blaze of glory. light increased to the fullest, when we need it the most. and eventually, consensus decided to go with increasing light, to remind us of the miracle. the metaphor, if you will, over the literal. 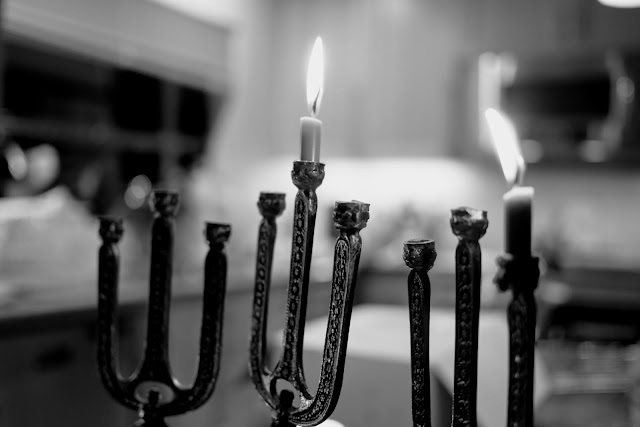 now, I won't argue against this tradition: I, too, love seeing the candles increase each night, til we get to the fullness of the eighth night, when all nine candles (including the shumash/ helper candle) are burning brightly. I love that, and it is indeed, the hopefulness I need at this time of year. especially in these last few years, when the weltschmertz is at such a high. but, let me remind myself for a minute that even when the lights decrease each night, there is still light. that the literal works, too, not just the metaphor. and let me remind myself that the metaphor of light triumphing over darkness is tainted by systemic racism. because everything (literally, everything) is tainted by systemic racism. and to defeat white supremacy, we need to remind ourselves to check all our assumptions and work to decolonize our language. and maybe in these days we need the literal blessing (the miracle) more than we need the metaphorical.